The insignificance of the significant pvalue « Nothing in Biology Makes Sense! This entry was posted in publish and/or perish, scholarship. Hmm. I’m glad you like the ASA statement (which was, indeed awesome). 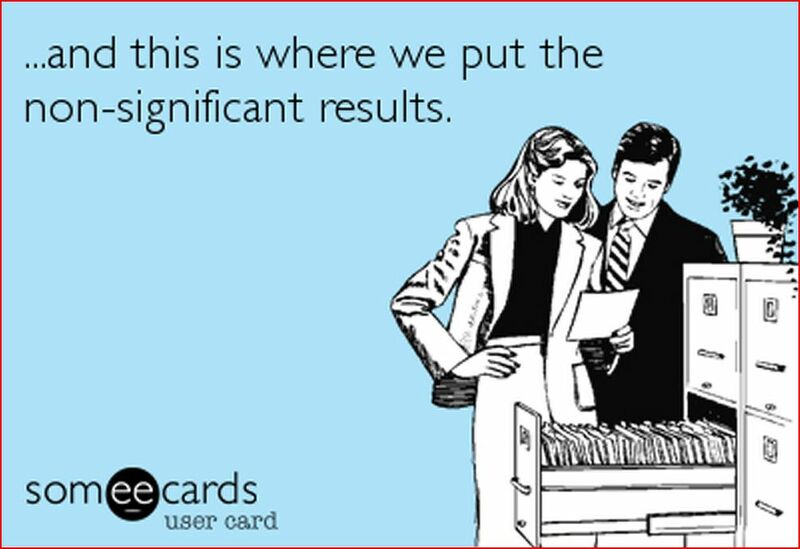 But that statement emphatically did NOT say that a significant p-value was “insignificant”, per your post’s title! 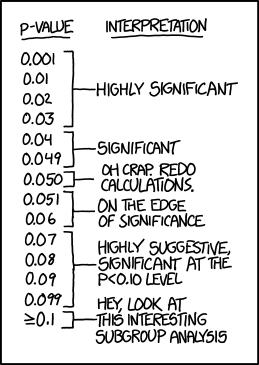 And no matter how awesome xkcd is (and it’s pretty awesome), that particular cartoon actually makes fun of something (continuous interpretation of p-values) that the ASA endorses (and about which I posted here: http://wp.me/p5x2kS-cR). So – I’m glad to see your post and referring people to the excellent ASA statement is a Good Thing. But I wonder if you could expand a bit on what argument you’re making here? Because I don’t think it’s actually what a reader might think from the title or the graphics… But correct me if I’m wrong! Sorry about the title. I’m in the middle of writing my dissertation and my ability to come up with clever titles is currently limited as my brain power is being expended elsewhere. I like your post! In reference to it (and to my general argument) is that I’m a continualist, and I think the value of a p value is that it tells you something important about your data, but is not a line in the sand by which results should be significant or not. There are too many other factors that should be considered, and I think that misusing analyses, or not clearly understanding what a pvalue is telling you is the reason some significant results are not significant or vice versa. By the way, don’t worry, my post titles get criticized too… Good luck with the dissertation!